The Star Spangled Banner, the US National Anthem, was not written until the war of 1812. America the Beautiful was not published until 1892. Battle Hymn of the Republic was a Civil War era song sung by the Union Army. My Country Tis of Thee, written in 1832 and our first traditional national anthem, was the United Kingdom's National Anthem with the words changed. The Star Spangled Banner didn't become the official anthem until 1931. 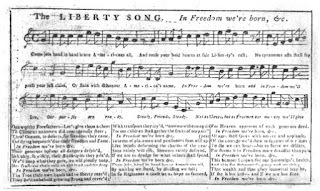 Even though these well known patriotic songs weren't written until well after the United States became a country, there was a patriotic song that became popular during the Revolutionary War. Liberty Song was written by Founding Father John Dickinson. The song was first published in the Boston Gazette in 1768. It was one of the first patriotic songs and included the phrase, "United We Stand, Divided We Fall," for the first time in the sixth verse. 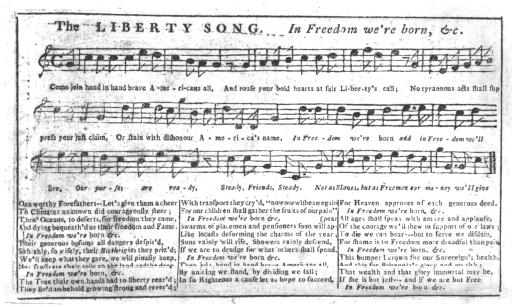 In 1770, the words were changed to reflect growing hostilities toward Great Brittain, and the song was renamed The Massachusetts Song of Liberty. Nor frustrate their toils on the land and the deep. If we are to drudge for what others shall defend. To die we can bear, but to serve we disdain. If She is but Just, and if we are but Free. Nor a host of oppressors shall smother the flame. And scorn to survive, if unable to save. If you'd like to listen to it, here is the YouTube link. I don't think it will replace the Star Spangled Banner any time soon. Tamera Lynn Kraft has always loved adventures. She loves to write historical fiction set in the United States because there are so many stories in American history. There are strong elements of faith, romance, suspense and adventure in her stories. She is executive editor of Mt Zion Ridge Press.